A bus ride on SBS Transit service 240 turned bloody for a passenger last week, after some sharp metal objects "embedded" in a bus seat left a cut on her hand. The bus has since been recalled by the transport operator. Polytechnic student Deonne Tan, 18, was on a short bus ride with her sister in the Taman Jurong area last Tuesday evening. 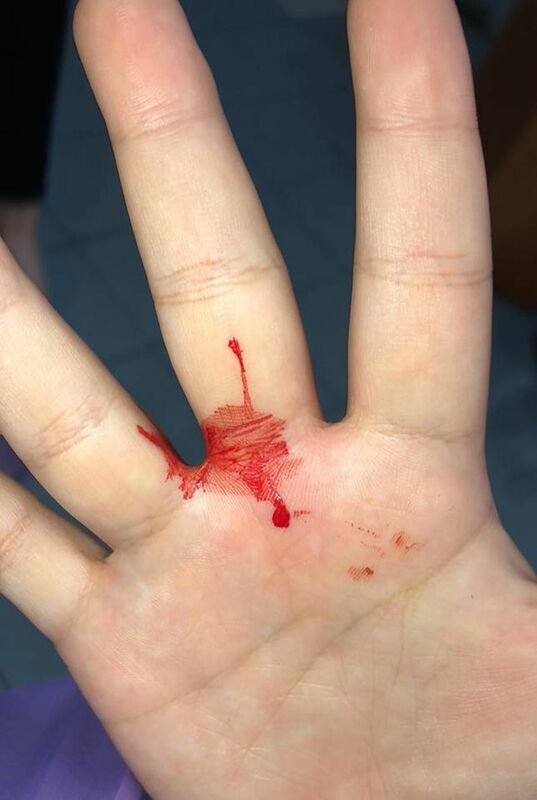 "Immediately, I felt a sharp pain and, almost instantly, I saw that my hand was starting to bleed," said Ms Tan in a Facebook post that has since been shared widely on social media. After inspecting the seat, she found four sharp metal edges resembling the ends of staples peeking out from the seat. They were "so deeply embedded" that they could not be easily seen if one did not pay close attention, she wrote. Although her sister had sat on the seat, she was not hurt as she was wearing a pair of thick jeans. "I was quite shocked and didn't know how to respond, so I just took some photos because we didn't want to delay the bus," Ms Tan told The Sunday Times yesterday. She later called SBS Transit to inform them about the incident. Ms Tan told ST that SBS Transit had responded to her via e-mail, saying that the incident was unlikely an act of mischief. The company added that the metal objects may have been part of the seat. She also received a hamper from the transport operator on Friday, apologising for the incident and wishing her a speedy recovery. Responding to ST's queries, Ms Tammy Tan, SBS Transit's senior vice-president of corporate communications, said: "We are already in touch with Ms Tan to see how we can assist her." She added that the bus has been recalled and the protruding "staples" have been removed. "We are also conducting an investigation into the matter," she said. Ms Deonne Tan noted that while the cut, which took two days to heal, did not cause her much pain or inconvenience, she is now more careful when sitting in buses. The incident last week comes after a landscape technician admitted sticking toothpicks in bus seats on four separate occasions on SBS Transit service 123M between July and August. Although he said it was a prank and he did it because he was bored, the acts damaged the seats and risked injuring other passengers, a court heard. Lim Lye Seng, 60, pleaded guilty last month to two charges of mischief. His case will be heard again tomorrow. For each count of mischief, Lim can be jailed for up to a year and also fined.